From Nantes to Tour, I was fully immersed in wine, food, and French culture. I explored the wineries and vineyards of Loire by car, foot, bike, Solex and even from above on a hot air balloon. The local cuisine included every type of pâté, tartare, rillette, and cheese imaginable. The locals were always welcoming, but I don't think I would have gotten around the small towns without my trusty French guide and translator. Every winery was so unique in terms of offering but I could feel each winemaker's passion and understand their visions and goals, which were often to follow in the footsteps of their ancestors. I was constantly impressed by quality and dedication, as many of the estates specialized in organic, natural, or lutte raisonnee winemaking methods. Many of the wineries in France will begin picking about 2 weeks earlier than the majority of their previous vintages due to the abnormally hot summer. This can be good news however, as the sooner the grapes come inside, the less of a chance they'll be damaged by inclement fall weather. Before digging into the vino, there are a few activities that I definitely recommend checking out. First, the hot air ballon. While the flight is never guaranteed and you may end up waiting a bit due to weather, it's definitely worth the time and money. Coasting across the vineyards overlooking all of the towns, people and animals was an experience I will never forget. Next, the Solex tour. A Solex is a motorized bike originally developed in the 1940s and a total blast. It takes around 10 minutes to figure it out, but after that you'll be well on your way to a fun (and pretty fast ride). Ours ended in a picnic amongst the vines, complete with wine and cheese of course. Don’t forget the castles! We visited Château de Chenonceau, Château de Chinon and Château de Brissac, all completely different in terms of era and style. The history is uncanny and you’ll find yourself putting pieces of ancient royalty together in your mind. 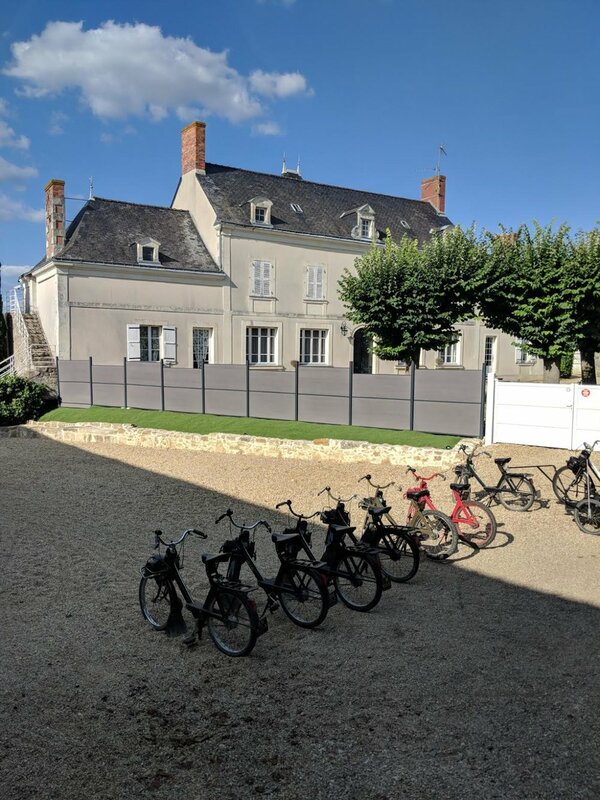 Lastly, make sure to rent bikes for a day of cycling along the banks of the Loire Valley. Plan your day right and you’ll be stopping every hour to taste wine and tour the magnificent caves of the region. On to the juice… I highly recommend visiting the below outstanding wineries when travelling through the Loire Valley. Domaine de la Pepiere is a Certified Biodynamic winery specializing in Muscadet and consisting of 40 hectares within the Pays-Nantes. Gwénaëlle Croix is one of the three owners (unrelated) who walked us through the vineyards and tasting at the winery. Gwen explained that Melon de Bourgogne (or Muscadet) has large, melon-shaped leaves, which could be the root of the grape’s name. The vines are very close together and quite low to the ground, allowing their tall, narrow tractors to straddle the vines easily. This is common throughout Muscadet, though horses historically did this job. The climate here is mild, since the vineyards are close to the sea. The vines are trained along two wires, rather than one, which is more common in Loire and the region of Muscadet. The reasoning behind this is to encourage photosynthesis and also aid in protection from hostile weather. Like most of the region, Pépière’s Muscadet does not see malolactic fermentation. Gwen described the importance of temperature control in her steel vats, which need to be cooled twice per day during fermentation. Pépière produces approximately 200,000 bottles per year and 80% of that gets exported! 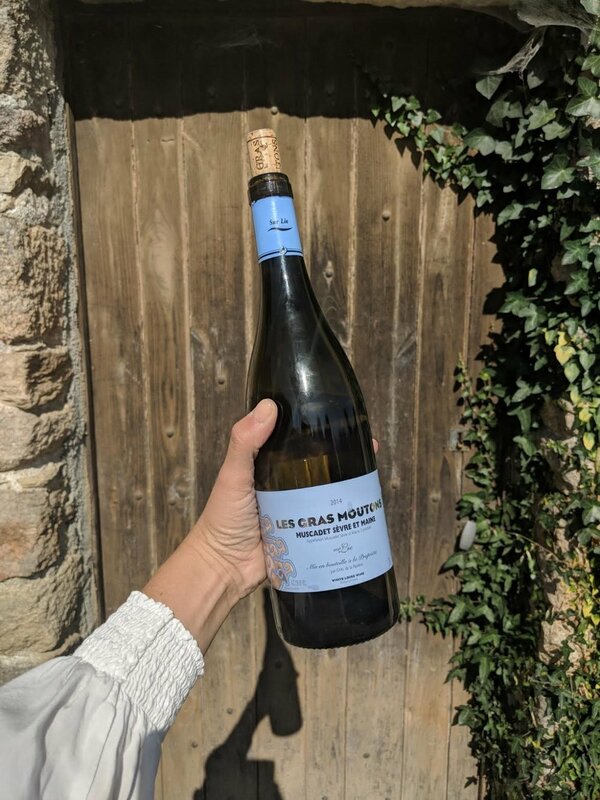 We proceeded to taste the lineup of Muscadet wines by sub-zones, which were easily distinguishable after learning about the varying soil types. Granodiorite was one of the most interesting to me, which is a granite made up of amphibolite, mica, and quartz. Wines from this soil had very granite-like minerality, along with fresh lime and wet stones on across the palate. Pied Flond has been producing wine for seven generations just 18 miles from Angers in the town of Terranjou. Franck and Catherine Gourdon started making wine in 2000 and specialize in the still, sweet and sparkling production of Chenin Blanc, along with Rosé d'Anjou from Cabernet Sauvignon and Anjou Rouge from Gamay. The family has 24 hectares of vines, which the family tends to in a sustainable manner. The estate also has a long history of Solex production. Franck started making these motorized bicycles with his brother at ages 16 and 18. Riding these around the vineyards was an absolute blast, after we got the hang of it that is. The tasting was comprised of several styles of wine from dry to the very sweet, even botrytized. The 2016 Coteaux du Lyon falls into the latter, yet still delicate in aroma and body, I’d rather pair it with goat cheese than a dessert. Gratien and Meyer was the largest estate we visited, specializing in the production of Cremant de Loire since 1874. Our tour began in their underground caves that house over 5 million bottles in over 3 miles -it was huge. The estate even has their own underground spring, which was once used to wash the barrels. Directly above the cellars are 20 hectares of vines purchased in 1864 by Alfred Gratien. Alfred died in his fourties when his partner, Jean-Albert Meyer took over the estate with Alfred’s widow. The wines produced today fall into two categories, Cremant de Loire AOC and Saumur Mousseux AOC, depending on the varietals used in the blend. Sparkling wine labeled Saumur Mousseaux must be entirely from Chenin Blanc. Cremant de Loire is more flexible, allowing Chardonnay, Cabernet Franc and Pinot Noir, among others. Gratien & Meyer often blend the three mentioned. The aging requirement for both AOCs is 12 months, but the estate ages them for at least 24 months and up to 6 years for the best vintages of Flamme d’Or. Flamme d’Or is a style of Cremant de Loire that is matured and vinified in oak barrels. 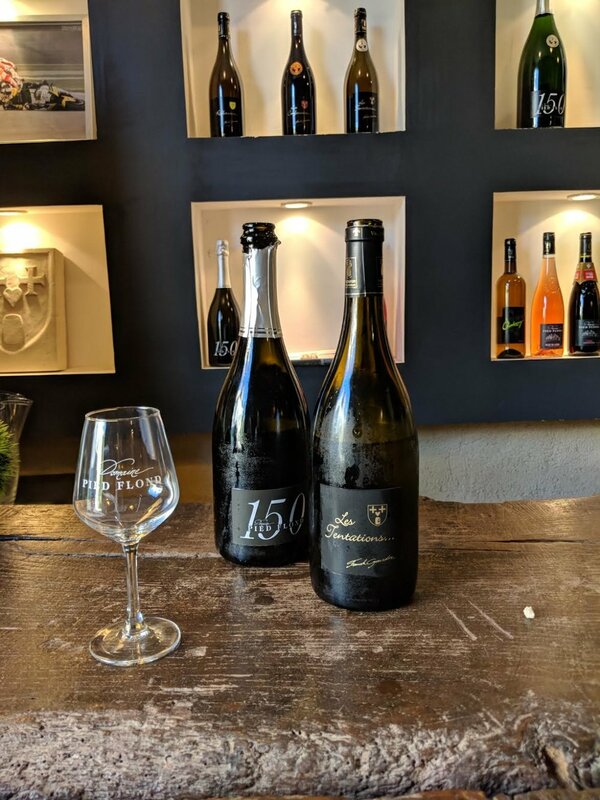 We tasted all of these styles but one of the standouts was the Cremant de Loire Brut out of Magnum, which was bottled for their 150 year anniversary in 2014. The blend of 70% Chardonnay and 30% Pinot Noir was aged 6 months in oak and tasted very much like champagne, in my opinion. There was slightly more acidity than the other wines, and my notes included peach puree, pear skin and fresh herbs. Château de Parnay is a certified organic winery that consists of 35 hectares of vineyards in Saumur-Champigny, above slate-driven soil. Only about 10-15% of their wine is currently exported. Perhaps the most unique feature in this winery are the 11 walls of limestone every third or fourth row of vines. These walls provide shade, protect from wind and keep the roots fresh and complex. They have also found that the roots mature more quickly when closer to the limestone walls. The ancient fortress now owned by the winery dates back to the 10th century. In 2006, Matias Levron purchased the historic castle, winery, and caves, near the Loire Valley School of Phyloxera. The large range of wines we tasted were very complex. I was very impressed with the quality and minerality in the Chenin Blanc, perhaps due to the limestone walls mentioned. Domaine Mabileau – Reze la Jarnoterie is a 5th generation winery known for aging Cabernet Franc in chestnut barrels. Co-owner, Carine Reze led us through some of her 25 hectares of vineyards. Most people in Saint-Nicolas-de-Bourgueil plant grass around their vines to improve quality and limit roots from going too deep into the soil. The estate practices very precise picking followed by slow extraction for elegant, deep flavors and low tannins for their, always Cabernet Franc, wines. They pump over twice daily and very slowly after malolactic fermentation. The next part of our tour was a drive the wine into their below-ground cellar, yes drive. Here, Carine showed us their notorious chestnut barrels. The cellar was a quarry in the 10th century and part of a castle that was once used to store mushrooms. It is not just their own, however. Since 1978 they have shared it with between 15 and 60 other wineries and collectors as there is over one hectare of cave space. The constant temperature of 12 degrees Celsius and 80% humidity make this an ideal storage facility. The Chestnut barrels support this humidity and can be used for 30-40 years. Compare that to the 3 years they and most wineries utilize oak! As you can imagine, barrels this old hardly impart wood-like characteristics in the wine. The estate is not buying them anymore, however, as not many coopers still make them. Carine and her family have also built an underground event space, complete with a wood-burning fireplace. We tasted wines dating back to 2005, as Carine was enthusiastic about showing us how her Cabernet Franc can age, especially since many were matured solely in their chestnut barrels. The wines were well balanced, earth-driven and quite unique. Bernard Baudry started making wine in 1975 and his son, Matthieu joined him 15 years ago. Matthieu explained that 90% of their production is red, 5% rose and 5% Chinon Blanc (from Chenin Blanc). Their vineyards are spread out, ranging from valleys to slopes and plateaus, with several different types of soil. The estate chooses to vinify separately by region, to showcase the different soil types individually. He showed us a glass display case of each soil and placed his wines on top to distinguish which came from where. The winery has been Certified Organic for 6 years but practicing much longer. Matthieu explained that converting was not difficult. They believe in making wine as natural as possible, utilizing indigenous yeast from their vines and winery. 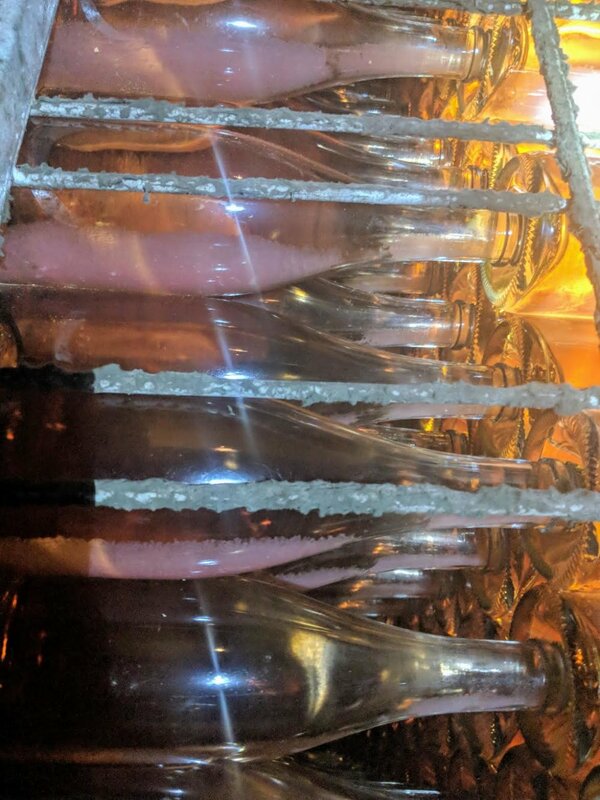 "I like my winery clean but not too clean," he said, explaining that he’s not using chemicals but doesn’t want to have to inoculate yeast either. The Baudry team strives to produce a wine that’s less extracted than the styles he has seen in Chinon over the years. He explains that the varietal is big in its own way, but today they are focused on an elegant style and lower yields help them control that. They have been exporting since the 90s, making lasting connections, as 40% of their production is being exported today. We tasted several different wines by sub-zones and soil types dating back to 1996. The ’96 Chinon was poured blind and none of us were even close. It was so fresh and floral we assumed it was from 2010 or 2013.